Prototype: German Railroad, Inc. (DB AG) class 102 electric locomotive (Skoda Type 109 E) in the "Traffic Red" paint scheme. The locomotive looks as it did new in 2016. Road number 102 003-1. 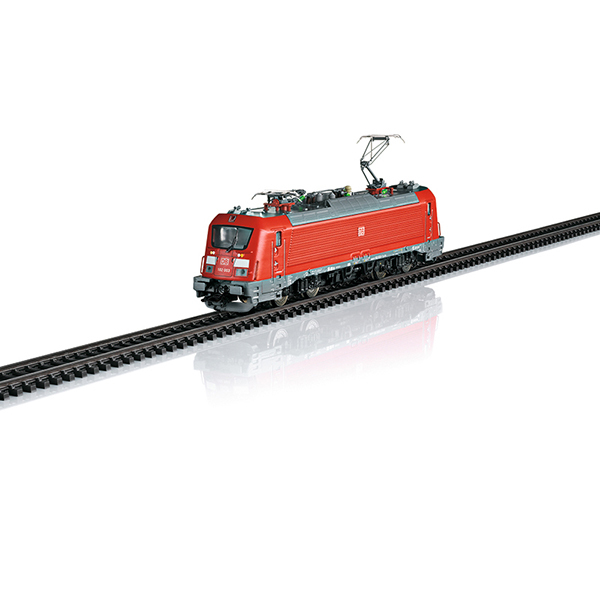 Model: This electric locomotive is constructed of metal and includes a digital decoder and extensive sound functions. It also has a special motor, centrally mounted. 4 axles powered by means of cardan shafts. Traction tires. Triple headlights and two red marker lights change over with the direction of travel, will work in conventional operation, and can be controlled digitally. The headlights at Locomotive End 2 and 1 can be turned off separately in digital operation. When the headlights at both ends are turned off, then the "Double 'A' Light" function is on at both ends. Warm white and red LEDs are used for the lighting. There are 2 mechanically working pantographs (no power pickup from catenary). Length over the buffers 20.7 cm / 8-1/8". In June of 2013, the DB AG took a risk and placed an order for the first time for six electric locomotives with the Czech locomotive builder ?koda, which is steeped in tradition. The order included six units of the type 109 E as the class 102 for the Munich-Nürnberg Express (MNE) with six six-part bi-level shuttle train sets. On July 24, 2008, ?koda presented its first three-phase locomotive with the factory designation of 109 E, the class 380, to the public. Preceding this was an order in 2003 from the Czech State Railways (?D) for 20 units with the following stipulations: supplement/replacement of the classes 371/372 in cross-border service, in addition, use under 3 kilovolts DC, permission to be operated in neighboring countries, and a maximum speed of at last 200 km/h / 125 mph. The reason for the long development period was the introduction of the EN 15227 Crash Norm, which mandated a reworking of the locomotive body design. Porsche Design contributed various designs for this, on which the current look is based. The locomotive body with its ribbed side walls sits on the welded, reinforced frame, whereby the cabs represent separate modules taking into account the newest crash-safety requirements. In the event of a collision, the use of special buffers and deformation elements protects the ends of the locomotive as does the deformation zone and the new design for the rail clearance devices. The three removable roof hoods consist of welded aluminum shapes to save weight. The two three-phase asynchronous motors per truck are controlled by means of two water-cooled IGBT rectifiers, each with four four-quadrant choppers and a braking unit. The traction motors switched in double star each have their own traction inverters for their individual wheel set control. After extensive testing of the two prototypes, the regular production locomotives, road numbers 380 003-020, were placed into service from 2009 to 2011. On June 27, 2013, the class 380 was given the name of the long-distance runner Emil Zátopek (1922–2000) in his honor. His nickname was “The Czech Locomotive”. In contrast to the Czech units, DB locomotives, road numbers 102 001-006, are only configured for 15 kilovolts / 16.7 hertz. Other equipment features conforming to DB usage are the DSA single-arm pantographs with three-point mounting as well as the use of ZDS/ZWS, PZB, ETCS Level 1, and a fully automatic brake testing system.